We take pride in our emergency roadside services and feel nobody does it better; for this reason, it constitutes a large portion of our business. When your equipment breaks, your phone call prompts us to provide an immediate response. Our goal is to efficiently and effectively make a repair on the spot and get your equipment back to the job at hand. We thrive on successfully making repairs without you having to incur a towing fee. Aided by computerized technology, our mechanics can accurately diagnose the fault with your equipment, and determine the steps in repair. We carry in our vehicles many of the most common parts that may be required to make an emergency repair. Our service trucks are stocked with a variety of air, fuel, coolant and hydraulic line along with major air brake components, electrical components, bulbs, and much more to get you rolling. If a part we don’t stock is needed, we can typically retrieve it close by at one of our many suppliers, conveniently located throughout our service area. In the rare instance a part needs to be over-nighted, is obsolete, or unavailable, you need not worry about your driver being stranded. We will stay with a stranded driver until transportation arrangements can be made or if necessary, we will even take the driver to a safe location until arrangements can be made. 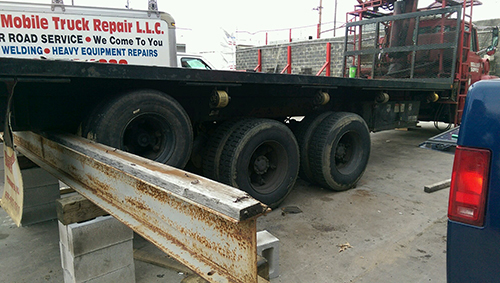 All commercial motor vehicles (CMV) that weigh more than 10,000 pounds must undergo annual DOT inspections. Our team of highly trained diesel mechanics will inspect, repair and return your vehicles to active duty as quickly as possible.